If you’re looking for aggressive, cheap creatures that have odd interactions there’s Hungry Spriggan. Green control decks that want a wide win condition can get an enormous payout from Howl of the Night Pack, and there’s a whole deck full of persist or undying threats you can get out of Impromptu Raid with Lorwyn’s own Cream of the Crop. What’s more, you can trade Repel Intruders for one to three spells, which is a pretty good deal. In highlander formats, that’s pretty sweet. Then there’s River Kelpie, an all-purpose allstar in any Sultai deck that cares about its graveyard (which is all of them). 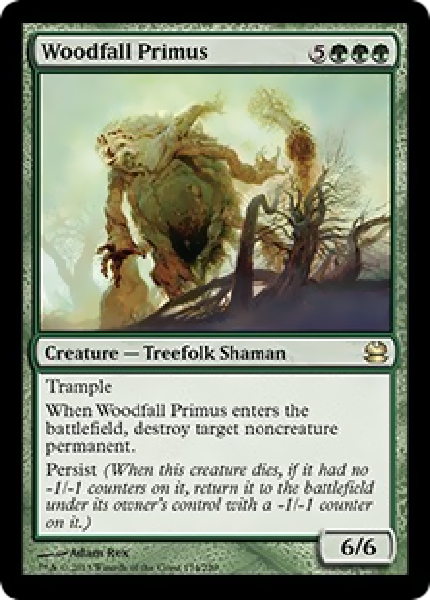 I first got to play with Woodfall Primus in a standard deck that ran on 2-drops and Cream of the Crop and Impromptu Raid. Then I realised that there was literally no option for the deck better than to dump land-eating Primuses on the board in as many different ways as I could, since it would dig six, then five deep to find The Next Primus. It’s since had to be more of a bench-sitting team player! Obviously. Not every deck can afford to play eight mana value engines, even if they are quite a value engine. If your deck can generate large amounts of mana, though, the Primus can be one of those plays that both breaks a stall by getting rid of a key problem, then takes over the battlefield. It’s a sweet card, but it’s definitely not tight. Eventide had a lot more hybrid cards in green-blue and green-black, combos I favoured. The Lieges didn’t blow me away, not really, but you can at least appreciate that Murkfiend Liege and Creakwood Liege are decently beefy threats with a pertinent special ability of their own – one creating an army, the other offering vigilance. There’s Wake Thrasher, a small threat that gets out of hand over time, and Overbeing Of Myth will always be a rock-star splashy threat. There’s also Oona’s Grace, a card I still want to use along with Null Profusion or Recycle, and don’t forget Rekindled Flame as a card that red decks can use to add pressure. 4 Damage for 4 Mana isn’t great, but it is a really big deal when you can keep getting it back while you keep pressure on your opponents. Finally, I love the Mimics, particularly Shorecrasher Mimic. Don’t have a deck for it yet. Okay, so now let’s have a brief complain-fest. I really like Cold-Eyed Selkie. It’s my pet card from Eventide, after all. It’s a nice little bundle of things that work in the colours it’s in. Blue has an easier time getting it through, but a harder time making it hit harder. Green has an easier time making it hit harder, but has a harder time getting it through. Both of these are meaningful challenges but it changes how they react to the card and how they play with it. It is reasonable that this card is both green and blue, and can be cast as either. Under current Commander rules, this card cannot be played in a Tetsuko Umezawa deck, nor can it be played in a Rhonas the Indomitable deck. The current view of colour identity with commander treat a hybrid card as if it can only be played in both colours, not either one or the other. Gold cards have that behaviour. You can’t play a Edric, Spymaster of Trest without Green and Blue. That’s why he’s Gold. But the Cold-Eyed Selkie and the Gilder Bairn and Wistful Selkie are not. They are hybrid, which means that in all other formats of magic, they behave differently. I really would like it if this was reconsidered.